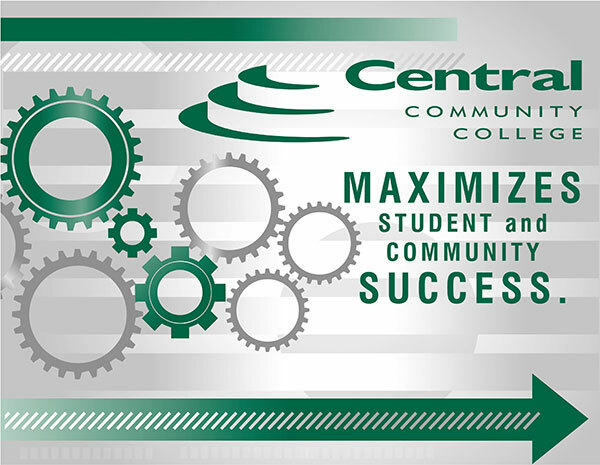 Central Community College maximizes student and community success. The strategic planning process was initiated in October 2014 with the reveal of the approved mission-vision-values-student success statements at the all-college in-service. All employees viewed unfinished business from the previous strategic plan and identified what they believed were remaining priorities from that plan. These statements represent thoughtful collaboration from a variety of stakeholders. Starting in February 2014, all-campus and all-center meetings provided an opportunity for CCC employees to consider what success looks like for our students. Using the World Cafe model, employees worked in small groups to discuss “student success.” This same model was used in a conversation in April with our high school articulation partners. Advisory committees including business and industry representatives as well as current and former CCC students also took part in a conversation about student success. A steering committee, representative of CCC staff, faculty, and administration, used the stakeholder input as they worked to develop draft statements for Central Community College’s mission, vision, values and student success definition. for students to achieve their educational goals. for developing a skilled workforce. student success and individual attention. recognizing the importance of individual needs, providing comprehensive student support services, and producing academic and technical challenge; promoting student success by creating a learner-centered environment that supports holistic student development. delivering instruction through multiple methods and quality support services; emphasizing student success by meeting students where they are through open enrollment and by providing extraordinary value in education. serving the needs of diverse learners; fostering a commitment to lifelong learning by preparing students for their future in an interconnected global society. fostering rural economic development by promoting and creating educational opportunities through mutually respectful and beneficial partnerships. valuing diversity within our student body and among our board of governors, faculty, staff and administration. exercising and upholding financial, social and environmental stewardship. using data and stakeholder input to make informed decisions in the best interest of students. being proactive in exploring, developing and implementing new programming and services to meet constituents’ needs. demonstrating high ethical and professional standards; continuing to build on Central Community College’s heritage while envisioning our future. skilled, knowledgeable and independent lifelong learners who possess the work ethic and communication skills necessary for successfully completing their college educational goals. innovative problem solvers who are adaptable, inquisitive and prepared for their future in an interconnected global society. accountable, motivated and collaborative leaders who make a positive difference in their professions and communities.